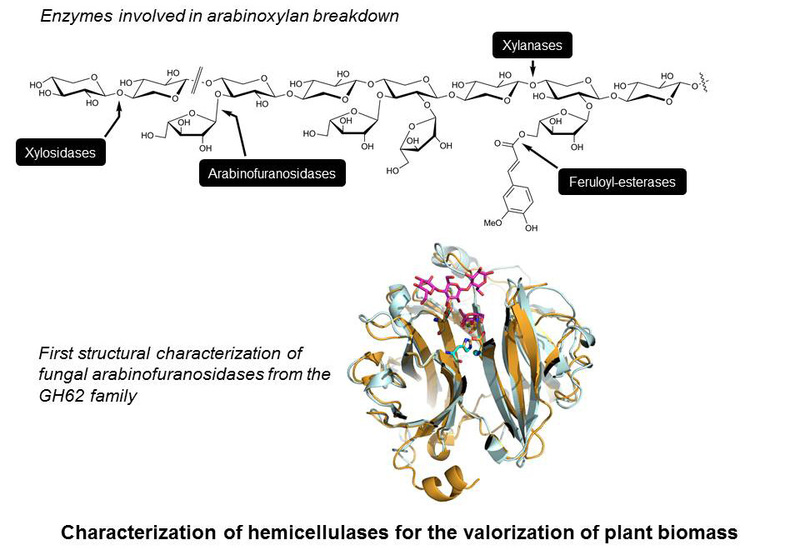 Several projects dedicated to the structural characterization of enzymes used for the biotransformation and valorization of agricultural resources and for the biotransformation of synthetic molecules are underway. Our major goal is to contribute to improving stability, selectivity, specificity and kinetics of enzymatic catalysts through the study of their structure-function/activity relationships. The first protein that was investigated is the Lip2 lipase, a very promising biocatalyst from the yeast Yarrowia lipolytica (Biophys J 2010). A second project was about the dextransucrase DSR E from Leuconostoc mesenteroides, which is used in industry for the synthesis of molecules with prebiotic properties (J Biol Chem 2012a). A third project focused on two amylosucrases, ASNp from Neisseria polysaccharea and ASDg from Deinococcus geothermalis. These enzymes use sucrose as glycosyl donor and are of great interest for the synthesis of glycoconjugates from exogenous acceptors, a property that can be used to set up new chemo-enzymatic synthetic pathways. Several structures of the two enzymes, including those of complexes and variants, have been determined (J Biol Chem 2012b, J Am Chem Soc 2012). Structural analysis coupled to molecular dynamics simulations emphasized the importance of the local conformation of the catalytic residues but also the dynamics of these proteins during catalysis. More recently, we provided the first structural characterization of two fungal alpha-L-arabinofuranosidases representing two distinct subfamilies from the glycoside hydrolase GH62 family, which takes part in the deconstruction of plant cell wall polysaccharides (J Biol Chem 2014).